An homage to classic horror, pulp, and supernatural tales that's absolutely worth your time. 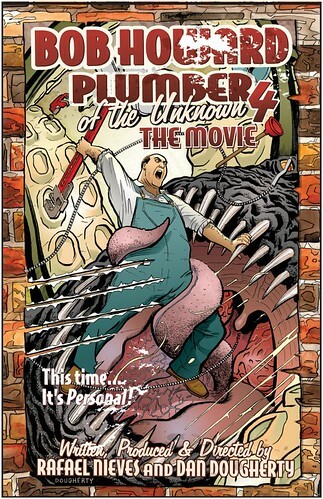 Released in August of 2012 to coincide with the annual Wizard World Chicago Comic Convention, the fourth issue of Bob Howard, Plumber of the Unknown serves a dual purpose. For those unfamiliar with the character, created by writer Rafael Nieves and artist Dan Dougherty, this issue serves as one of those perfect jumping on points, where everything you need to know about the character is encapsulated in one story. For those of us who’ve been following Bob’s exploits for a while now, this issue is the proverbial “one you’ve been waiting for”. It’s the big origin issue in which everything is explained and nothing will ever be the same. And it’s one hell of a ride! For the uninitiated, Bob Howard is an average guy living a not-so-average life. He’s a plumber by trade, but seems to wind up taking on all manner of odd jobs. Problem is, a simple job of snaking a drain usually finds him dealing with a serpent the size of a school bus and a call to investigate some annoying rats in the wall has more in common with the Lovecraft story of the same name than it does a simple rodent infestation. The book is peppered with a dark humor and various sorts of homage to classic horror, pulp, and supernatural tales, offering an appeal to fans of the genre as well as those simply seeking an entertaining adventure story. Nieves pulls off an impressive and probably overlooked feat in this issue: it picks up right where the previous issue left off without leaving the reader feeling left out in the cold as though they’ve walked into the middle of a story. That might not sound like much, but it’s a technique that many modern writers of sequential art seem to have forgotten how to do. Anyway, as the issue opens, we find our hero employed at a local movie theater (quite appropriate considering the fact that the comic has already been optioned for the big screen during its brief history) in the middle of a midnight screening when the theater is overrun by various ghouls, ghosts, and goblins. As Bob sits enraptured, readers are treated to a flashback sequence told in the form of a cinematic version of Bob’s life. Rather than the typical middle-aged-plumber-fighting-demons story that we’ve come to expect (did I actually just type that? ), the tale told here is one of a family man doting on his loving wife and daughter. The dark wit we’ve become accustomed to with these stories is replaced by a jovial charm and playful banter between a close-knit family…which makes it that much harder to handle when the shadows find their way back in. For his part, artist Dougherty does what he does best and keeping with Nieves’ writing, finds a way to zig when you thought he’d zag by putting a few new spins on his art. I’ve come to expect solid storytelling and well-paced layouts from Dougherty, but I’m constantly impressed with the evolution of his work. His style on Bob Howard might be best described as a blending of lifelike realism and emotive caricature and with each successive issue, I find that blend getting closer and closer to exactly the right mix. The expressions and body language of his characters hit all the right notes and the inking in this story adds an extra dimension, casting both a literal and figurative shadow over the artwork that proves to be a perfect match for the darkness of the story. As I said earlier, Bob Howard, Plumber of the Unknown #4 lives up to that age-old promise that so many comics plaster across their covers: it’s the one you’ve been waiting for. Not only is it an origin issue which finally explains the history and motivations of its protagonist, it’s the issue in which the tone of the series takes a dramatic shift. Yes, it’s still the same Bob Howard, packed with big-screen-style action, sharp comedy, grody monsters, and all manner of things that go “schlurp” in the night, but by finally allowing us to see Bob’s past, Nieves has given us all the more reason to pay attention to his future. In just one short issue, he introduces us to and makes us fall in love with not only Bob’s family, but his life before witnessing the tragedy that started the simple plumber on his path into arcane realms.